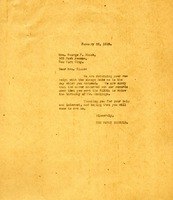 Mr. Starr writes to Miss Berry to suggest she bring her case to ex-President Coolidge and ex Governor Smith. He also says that he is writing to the Banker's Trust Co. "urging your claims" so that Miss Berry doesn't have to work so hard. The 30th President of the United States visits Berry.